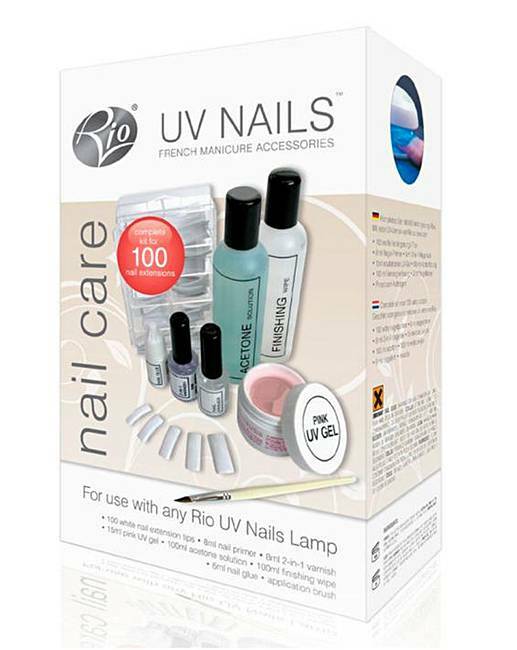 Rio UV Nail Accessory Kit is rated 4.5 out of 5 by 11. Rio UV NAil Extension Accessory Kit. Complete kit for 100 nail extensions. For use with Rio UV lamp nail extension systems. Contains 100 white nail extension tips. Also contains 8ml replacement nail primer, 15ml pink UV gel, 8ml 2-in-1 varnish, 100ml acetone solution, 6ml nail glue and 100ml finishing wipe. With this handy accessory pack you don’t have to worry about costly visits to the salon, because you have everything you need to keep your nails looking great at home. Rated 1 out of 5 by Rachel from Very bad This nail kit was so bad the gel didn't set with uv lamp not happy !! Rated 5 out of 5 by Junifer from great value This kit compliments the Rio UV nail systems kits and is excellent value for money. I would recommend this to anyone who havs previously purchased the UV lamp kits.Great for doing UV nails at home.